With the holidays already upon us, many will be boarding planes to celebrate with loved ones. Air travel can take a toll – not only on your mental health but also on your feet! Long delays and waiting periods, standing in line at security checks, then getting onto a cramped airplane can be unpleasant. 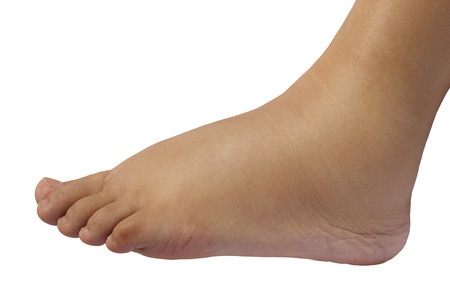 Often on longer flights issues like foot and ankle swelling – called edema – can occur. Stay hydrated – liquid restrictions at airport security checks can make it easy to forget to stay hydrated. However, staying hydrated is incredibly important. It keeps your blood flowing and prevents it from thickening. Keep moving – no matter how good the in-flight movie is, try not to get too comfy in that airplane seat. Regularly stand up and walk around and stretch if you can safely. If your pilot is stingy with the fasten seatbelt sign, keep blood flowing by doing simple in-seat exercises: rotate your feet and flex your ankles. Keep your legs uncrossed as well. Travel in comfy shoes – cramming your feet in uncomfortable shoes for long periods can contribute to swelling and poor blood circulation. Wear some nice, easy on, easy off comfortable shoes. It’ll also make security easier! Try compression socks – If you know you’re prone to swelling or if you have conditions like lower extremity lymphedema caused by blocked lymph nodes, compression socks might be the way to go. Compression socks and stockings increase circulation by compressing your veins in your feet and legs. Avoid salty, high sodium snacks – salty foods contribute to fluid retention, which can rapidly lead to swelling. Save the salted nuts, pretzels, and chips for a reward for a safe flight. Once you reach your destination, give your feet time to recover. If you notice swelling that doesn’t subside in a few days, it might be an indication of a serious issue. Swelling can be the result of kidney and heart problems, as well as hormonal or diet changes, so it is essential to get a professional opinion on the matter. Our podiatrists, Dr. David R. Sullivan, here at Westfield Foot and Ankle, LLC, have years of experience treating foot and ankle issues. If you are dealing with swelling, give us a call. You can reach our conveniently located Westfield, IN office, serving both Boone and Hamilton County, at 317-896-6655.